Throughout 2018, the unemployment rate hovered around 4% and continues to remain at the lowest levels it’s been in decades. Jobseekers are currently in the driver’s seat and are being more selective about potential job opportunities. Because of this, employers must turn to more passive candidates and look at long-term goals and strategies to acquire top talent. 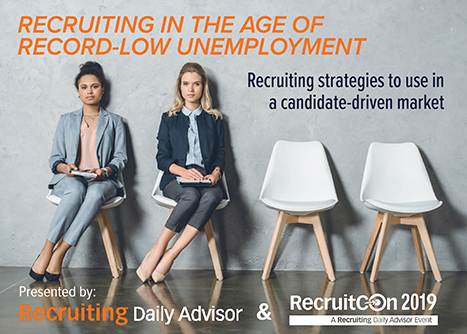 The Recruiting Daily Advisor research team conducted a survey throughout February 2019 to take a snapshot of the real-world recruiting landscape. In our fifth annual recruiting survey, which features data from over 530 respondents, we sought to uncover recruiting trends among employers nationwide.